If you’re like many parents, a few weeks into the new school year you’re probably desperate to come up with some different lunch ideas that your kid will eat, don’t take too long to make, and cover the nutritional bases. Help is on its way. Check out my recent blog post which includes suggestions and links for spicing things up on the school lunch front. Since I penned that post, I’ve discovered a couple of other resources you may want to look at. Eating Well put together a big back-to-school recipe guide, including creative ways to add brain-fueling foods such as oatmeal, yogurt, and beans. And in partnership with Whole Foods, school lunch reform advocate Ann Cooper launched thelunchbox.org, an online toolbox for improving lunches served up by school districts across the country. If you’re after more lunch box recipes then this contest is for you. 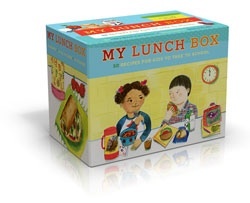 Share your most successful school lunch idea in the comment space below and you’ll be in the running to win a free My Lunch Box: 50 Recipes for Kids to Take to School by Hilary Shevlin Karmilowicz, a former chef, and current cooking teacher and mom, with illustrations by Rebecca Bradley. Like a lot of products marketed by Chronicle Books, My Lunch Box comes in a clever (or gimmicky, depending on your perspective) package. (Full disclosure here: I’m the author of City Walks: Sydney, one of Chronicle’s guides in the popular travel deck series.) In this instance, the material is presented in the form of a recipe card box, not a traditional cookbook. It’s the sort of thing that could easily fit on a kitchen counter for when you or your child need a little lunchtime inspiration. Inside you’ll find new spins on old standbys like Swirlin’ Twirlin’ Pinwheels (think PB&Js in easy-to-eat shapes) and Fruity Cheese Kabobs, along with some unexpected offerings such as Fill-’Er-Up Frittata, which calls for asparagus, and Zucchini Cupcakes (with avocado, which apparently keeps these wholesome treats ultra-moist). One quibble: There’s an emphasis on short-cuts — canned beans, store-bought salad dressings, hummus, and salsa — but there’s nothing to stop you or your kid from making these items from scratch, if you have the time and desire. The kit also comes with 15 blank recipe cards for family favorites and a bunch of stickers that say things like “Delish” and “I made this on ______,” which may help keep kids engaged in the lunch-packing process. Read a review on Epicurious. Feeling lucky? Submit your lunch tip below by 10 p.m. PST on Monday September 28 and I’ll choose an innovative offering as the prize winner. Just think, only nine more months of making school lunches to go! Update: Thanks everyone for chiming in with lunch box tips — including notes, cutting food into appealing shapes, and finding ways to keep lunch food cool dominated the suggestions, see below for details. The My Lunch Box guide goes to Karen, who weighed in with the idea of packing couscous in her kid’s lunch. I’m curious if Karen’s daughter eats it unadorned or if she has a recipe for this wholesome grain she’d like to share with us. Karen, send your contact details to me at: sarahhenry0509 [at] gmail.com so I can ship out the lunch guide to you. Thanks again to everyone for entering this contest and check back during October for another cookbook giveaway. My kids get so excited that I put in little notes. I can also pack lots of healthy things as long as I put in one little cookie. I can’t even imagine sticking bags of chips or junk in there. Use the single serve peanut butter cups. they most likely will throw the rest away! Make sure they will eat what you put in. I think that it is important to make it look appealing using cookie cutters and nice containers so that your child’s friends don’t tease them with: “Are you going to eat that?” If it is healthy and looks nice, they are more likely to eat it if they care what friends think. Put riddles in to the lunch box to. They can share them with others. Use cookie cutters to make shapes out of sandwiches. My daughter loves couscous in her lunch. Warm or cold it goes over very well with her. I use a bento style lunch box for my daughter and she picks out what she wants in the compartments every day (unless she says, “surprise me, mama”). I’ve learned not to worry about whether the things she picks “go together” as long as there’s some protein somewhere in the lunch box. Pickles go with anything, she’s taught me, and things she picks for lunch usually come home eaten. I ask her to help with the weekly shopping list so we get a few items that she wants to have in the lunch box during the week–just having some choices seems to help her eat. My kids love homemade mini cheese pizzas made from an English Muffin. Keep it simple but tasty and always include a fruit. Instead of having to track down ice packs that I put in the kids lunches and then they leave in their desks or whatever, I now use food as the icepack. Sometimes, I freeze gogurts or cups of yogurt. Other times it is frozen grapes or pineapple chunks. If I don’t have any frozen food in there, I put in a frozen juice box and by the time they are eating lunch 4 hours later, it is thawed out but has kept the cold stuff cool. Cut a sandwich into fun shapes using a cookie cutter! Mix it up based on the time of year/holidays/etc. to make it a surprise each time they open their lunch. Use an ice pack to keep everything cold. Don’t put too large of portions. Always put healthy things they love and sneak in a cute loving note. They love it. I’ve learned that when I make bento lunches they are going to be extremely popular and to pack a LOT of food- and extra chopsticks (or picks if the food is on them.) I started my food blog because of our bento adventures, funny to run across this today as I just did an article for Pink Lemonade on this. I let the kids choose what they like, that way, they don’t toss it out! I love putting little notes in their lunchboxes. They always give me a hug when returning home from school. We freeze our son’s fruit juice packs the night before so that way they are nice & cold when he opens them for lunch. Pack healthy and energizing snacks to keep them going throughout the day! I use quality bread to make sandwiches. I love the bread from Panera Bread or cheese loafs that is sold in many supermarkets. It makes a huge difference and it tastes like you’re eating at a fancy gourmet deli. I freeze their juice so it keeps everything cool and then is ice cold when it’s melted. Make sure to put something ‘awesome’ in the lunch bag to make your child smile, but not so awesome as to cause distraction! There’s only 20 or so minutes to eat! Suggestions: a family pic in plastic taped to the lid, tiny star-shaped cheese slices, a cookie with a sweet message in edible ink, a single slice of dessert sushi, etc. One cool idea I had was to use the edible ink to make a die out of a sugar cube. Label each of six small lunch items with a number from one to six, then have them roll the die to figure out the order in which to eat! Thanks for choosing me. We’ll be watching our mailbox. As for a recipe, I don’t use one. I usually cook up the couscous with chicken broth, a little lemon juice and a bit of lemon peel. We like the whole wheat couscous when I can get it. Some days we throw in lots of veggies, some days we leave them on the side. We’ve made it into a veggie and pasta salad as well with a vinaigrette dressing.